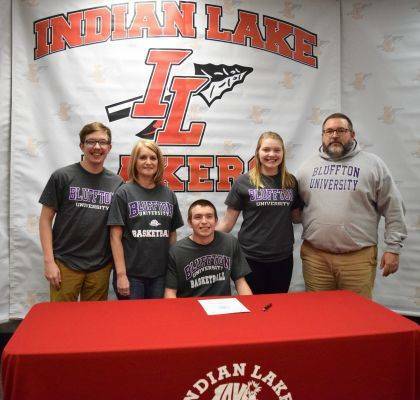 Indian Lake standout guard Kale Shoffner will further his career on the hard court at Bluffton University. It was a packed house as friends, family, coaches and school officials joined together as he signed his official Bluffton Beaver paperwork. Shoffner is a two-time First Team CBC basketball player and a key member of the Indian Lake football team’s state playoff success for the past three years. But former Indian Lake Head Basketball Coach David Starr says basketball is Kale’s priority. Kale plans to study sports management. He is the son of Dave and Janelle Shoffner of Huntsville.